Florida death metal murder machine Malevolent Creation are done recording their 11th album, dubbing it 'Invidious Dominion.' It's a Biblical title and we're banking on Mal C to fire off full throttle riffs that'll make you think a plague is upon you. 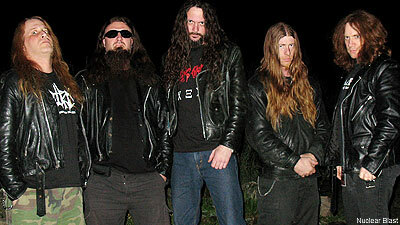 The album was produced by Erik Rutan of Hate Eternal/Morbid Angel notoriety. So how does Mal C remain fresh and interested in making aggressive music 11 albums deep? "We're truly just fans of brutal music, so our interest really never burns out," drummer Gus Rios told Noisecreep. "No matter what, you always want to top your last album and having some new blood in the band really helps stir new ideas, while keeping that Malevolent sound at the same time." The band's long term status only strengthened the songwriting process. "Me and Phil have been writing together since 1997 and we've known Gio since 1992, and Bret always delivers," Rios also said. "It all came together pretty easy. We knew that we wanted to write the most brutal, focused and relentless album in the band's history, really for one reason: to show that even after 11 albums, we can still outdo ourselves and put out the most murderous music yet! We take our music very seriously. That's why we now have good management, went with Erik Rutan for recording, and really focused on writing good songs. I think that the end result will speak for itself." As for the upcoming short run of dates, they're centered around the Central Illinois Metalfest and the band routed dates in conjunction with the fest so they could "showcase a new song and get people fired up about the new album," Rios said. "There will be one new song and the rest will definitely be classics. With three of the original members in the band, people will witness a real, old school Florida death metal onslaught!" The band will also feature t-shirt designs from the first two albums, one of which has never been available in the U.S. "Get ready for the merciless death metal machine that is Malevolent Creation," Rios said. So pop a handful of Advil and make sure to check out the show if it hits your hood.